Auto-Dry is a one-step method to developing a successful freeze drying run. Freeze drying protocol development historically required weeks or months of trial and error testing, but recent advancements in freeze drying process knowledge and the advancement of PLC control systems enable a successful freeze drying cycle to be performed on a single run while protecting the product and minimizing the cycle time. Other protocol development systems require a large product load and use approximating calculations to determine the product temperature. 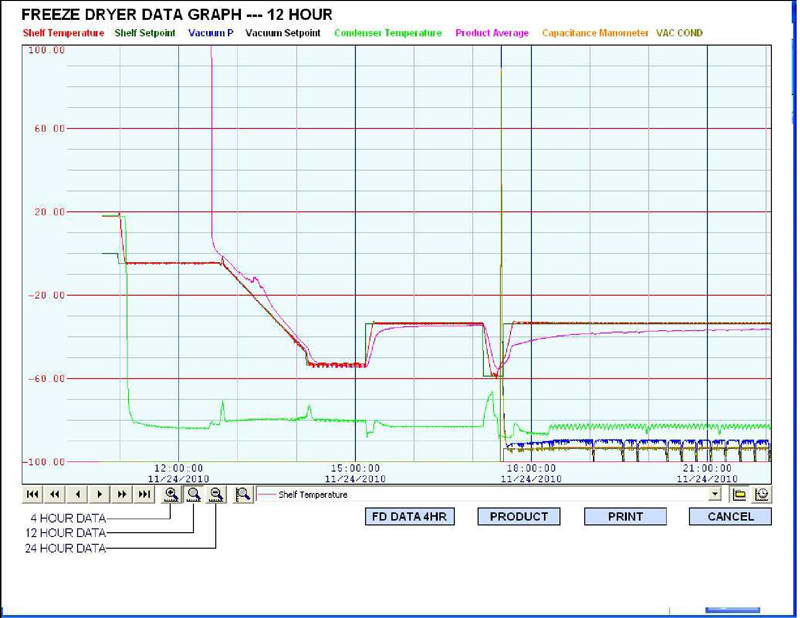 These methods result in very conservative cycles and do not adjust to the temperature variations that occur throughout the freeze dryer product chamber. Auto-Dry uses Millrocks’ patented ‘Critical Vial Method’ direct measurement of the product temperature and controls from the warmest vial, thus providing the maximum shelf temperature while eliminating the possibility melt-back or collapse. 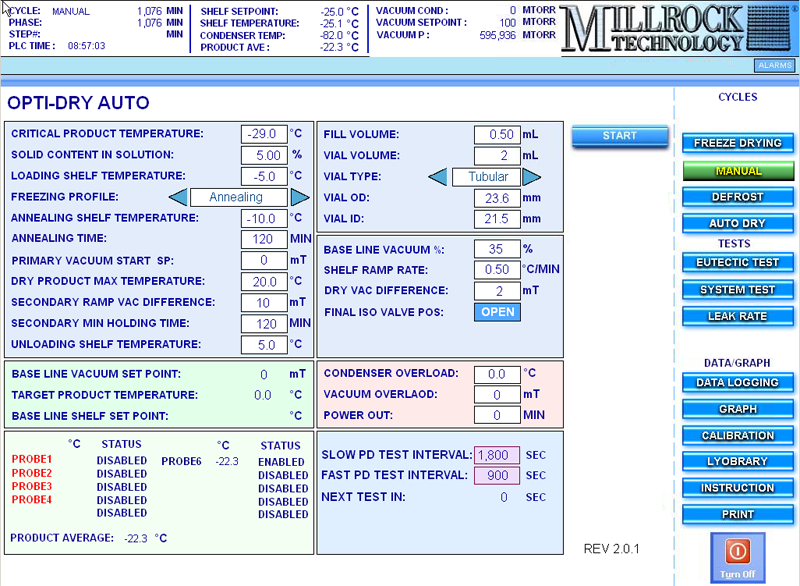 Since the method is not based on batch calculations Opti-Dry Auto is active throughout the entire primary drying cycle. Auto-Dry generates initial freeze drying parameters based on the critical product temperature and the solid content, including the freezing cycle, primary drying vacuum level and shelf temperature, and secondary drying shelf temperature and length. The freeze cycle can be a simple ramp or include an annealing cycle. During primary drying the shelf temperature is continuously adjusted, based on the highest product temperature. Either a conservative or an aggressive drying profile can be chosen to optimize the cycle. The results are based on actual product temperatures to compensate for the dynamic changes that occur throughout a freeze drying cycle. End of Primary Drying is determined using either, or a combination of, pressure rise testing and capacitance manometer versus pirani pressure measurement. A run can be performed with either a full batch or as little as one vial.